Samsung has introduced its latest device, the Samsung Power Sharing Cable - a double-ended Micro USB cable that allows for charging from a smartphone to another device such as a smartwatch. This is hardly earth shattering news we know, but with battery blues being one of the biggest concerns for early smartwatch users, the Power Sharing Cable certainly offers a short-term fix for the lifecycle issue. Using the Android Power Sharing app, you can control the amount of power to be transferred from your smartphone to your smartwatch, and also set a limit on the amount of juice to be left in the output device; so you won’t kill your mobile for the sake of your watch. The good news is the Samsung Power Sharing Cable is device agnostic, meaning it will work with any Android phone or tablet. So you don’t necessarily need to be part of Samsung’s Galaxy in order to benefit. The bad news is you’ll still need to carry around that extra charging cradle with you that most wearables come with at the moment. 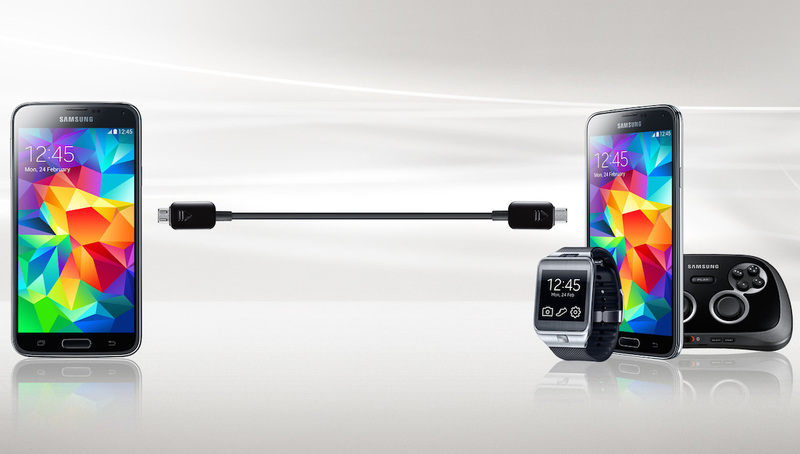 Universal Micro USB charging on smartwatches can’t come soon enough. However, the Power Sharing Cable does stick a plaster on the gaping wound that is smartwatch battery life and, at just £15, is a pretty handy accessory to have.